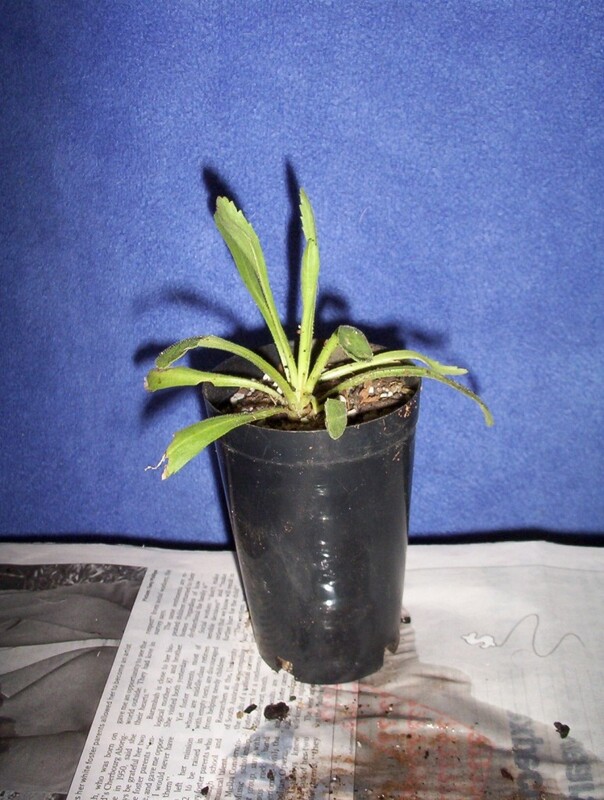 This little plant is a daisy 10-20cm high and 20-40cm wide and would make a great cottage garden plant in a shaded position during summer. It would also be good in a rockery or pot which is where I have it. I haven’t been confident about trying it in the ground. Now that I know how easily it is propagated I can try it in the ground. 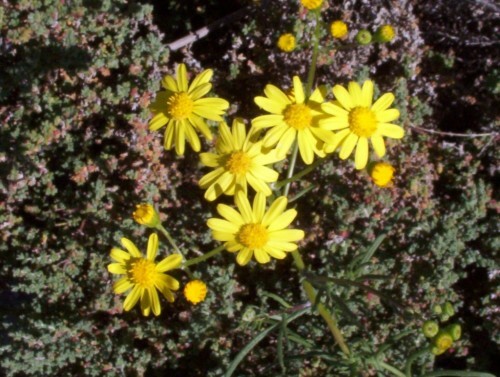 It is a little perennial in that it dies down during the heat of summer to reappear in autumn. It spreads rapidly by suckering and is the plant featured in the previous post. It needs root protection which can be achieved with gravel or stones or an organic mulch. 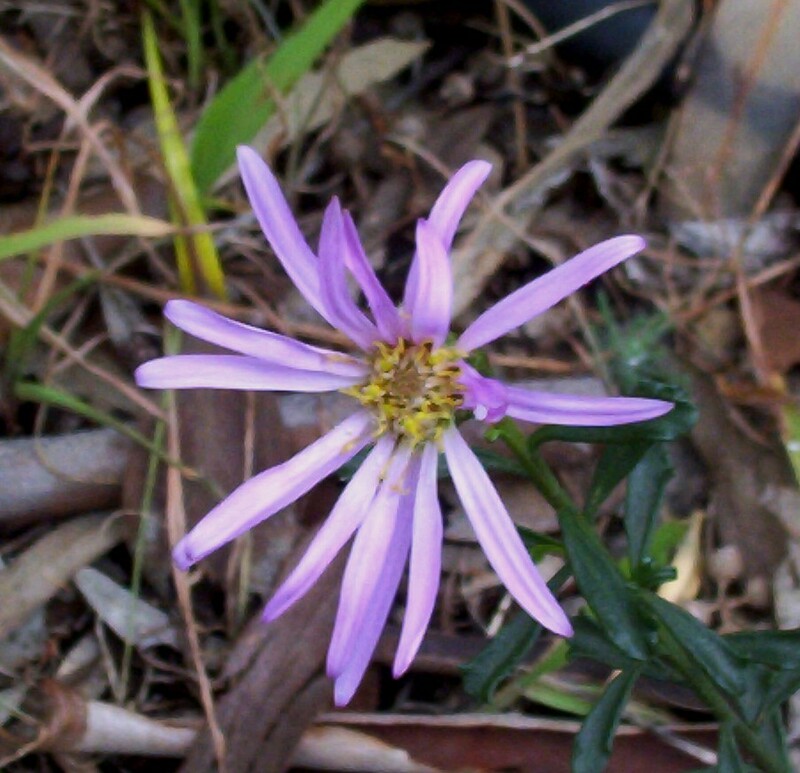 The flowers are mauve, 2-3cm across, and held above the leaves. It flowers in spring and autumn. It does best in cooler climates but is worth trying where a good mulch can be applied. It is frost tolerant to -5C. Snails and slugs love it, so precautions need to be taken. If the plant becomes tatty, cut the leaves off above the crown and fertilise and water. Sorting plants today, I came across some native daisies and violets and grasses which were very tight in their pots. There were multiple plants jammed in as the original plant had multiplied over the past year. The way to deal with them is to divide the pot full and repot the smaller bits or plant straight into the garden. The same applies for a clump that has got out of hand in the garden. A spade can be used to dig up a section which can be divided into smaller portions, some to replant and others to pot on to give away to appreciative folk or placed on a fund raising stall. Let the plants settle and grow on for a few weeks before doing this. Now would be a good time to divide and repot if plants are intended as Christmas gifts. The plant in the photos is a daisy Brachyscome tenuiscapa variety pubescens. The process is simple. Gather a serrated edged knife (like an old bread knife), secateurs, pots and potting mix and something with which to label the plant. Up end the pot and remove the whole clump. Examine the root ball to see where the divisions might be made. 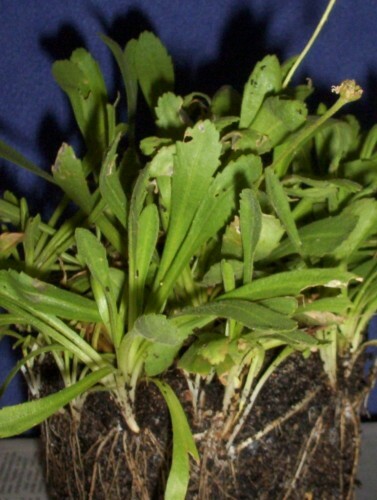 It is often easier to shake the potting mix from the roots so that individual small plants can be seen. Use knife or secateurs to cut between each plant, ensuring that some roots remain on each piece. 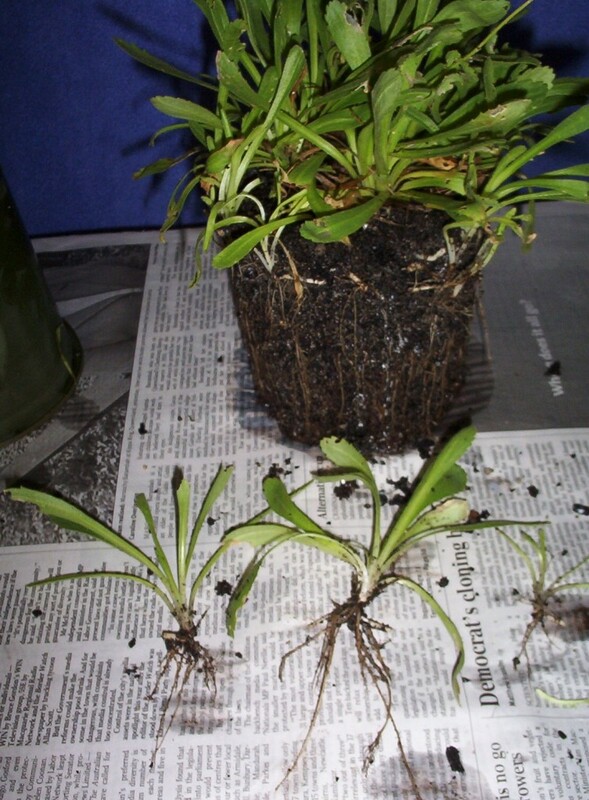 If there are no roots on some good pieces place them in some propagating mix and treat as a cutting. The other pieces can be repotted or planted out. I met one of the Australian Plant Society members at the garden that is going to be bulldozed. We had to make an educated guess as to where the damage is going to be done. There are a lot of plants involved in the area. 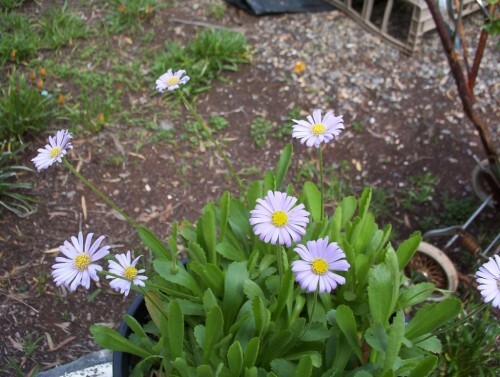 One of the first and easiest tasks was to dig up a little daisy, Brachsycome formosa. This is quite a small plant which multiplies by suckering. I have probably not given it the correct name. The Australian Daisy Study Group book on Brachyscomes calls this plant Brachyscome affinity formosa, meaning it is like it (known as Pilliga Daisy) but not quite. 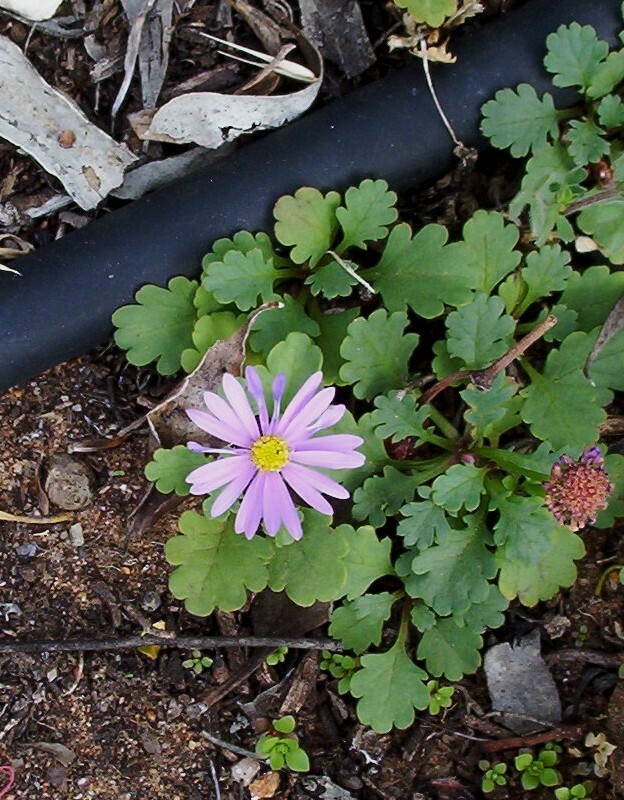 This one has a pretty mauve flower whereas Pilliga Daisy is cerise pink. It sends up new shoots away from the original plant. It is remarkably hardy. It survives by dying back during the heat of the summer, reappearing after autumn rains. We found dozens of little plants, some of which we potted with a view to relocating in the garden and others to pot at home as insurance. Considering the low rainfall here, this little plant is worth trying. This is a deep yellow daisy common around here. The seed germinates readily and the flowers create a delightful display. They are generally an annual but some can persist as a perennial if the season has been good. A good season like we had last year saw masses of the plants and a great floral display. Nowhere near the same number of plants this year but those that are there are beginning to flower. We saw some of these plants along the board walk at St Kilda the other day. There is a form that grows here known as the ‘Mallee’ form subspecies dissectifolia. The one at St Kilda would be the coastal form. They grow to a height of 40-60cm. They need full sun and good drainage. There is also a Forest form which grows in Victoria, New South Wales and Queensland. This form grows to 1m tall by about 80cm wide, with large leaves 4-15cm long. Tip pruning produces a bushier plant. I think these would be great as a bedding plant in gardens. They flower for months. I do like daisies. All sorts of daisies, including those that are not native to Australia. It was with excitement that I noticed the dark mauve flowers on my small Olearia magniflora, with some buds still to open. Mine doesn’t do as well as those we saw along the side of the road on the way back to Meribah in SA, after an excursion in Murray-Sunset National Park in Victoria. We call this park ‘Sunset’ as it was known by that name to the locals near where husband lived as a child. The Victorian Border could be seen from the property. Olearia magniflora is a small shrub to about a metre high and half a metre wide. It seems to grow in the dappled shade of mallee trees. Even though this is growing in a relatively tough environment, they are not the easiest to grow in a garden situation. Many of these plants resent too much moisture and exposure to wild winds. Hardy is a word that has different meanings to people depending on where they live. You are currently browsing the archives for the Daisies category.